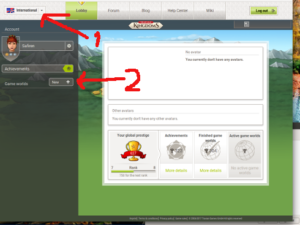 To play Kingdoms you have to register to get a lobby account. When you click on that link it tells you to start to play – don’t do that! You will be auto directed to a random server -chose Login and register instead! You choose domain in upper left corner. Test is on International and can’t be seen before start. 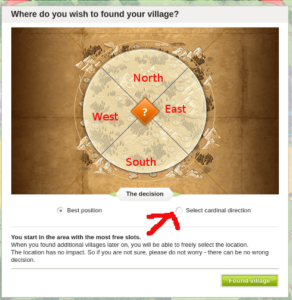 You choose server in Game worlds. When you start the game you will have a short tutorial to do. You choose your name in the tutorial. 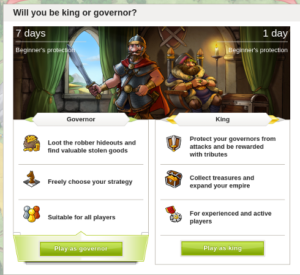 You will also get the choice to start as king or governor. 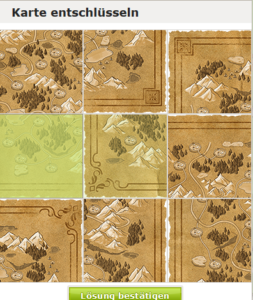 If you haven’t played Kingdoms before I recommend you to start as governor. You can change later in game if you wants to but governors can have more fun than kings 😉 As king you have a lot of duties and needs to be very active. The tutorial ends with a puzzle. After that you choose which quad to start in. If you don’t choose you will be placed random. Here is where many miss to choose. So be observant! If you have a dual or sitter you add him/her after server start. You will find a “Settings” icon (More) in the upper right corner in the white box in your lobby after you have started. 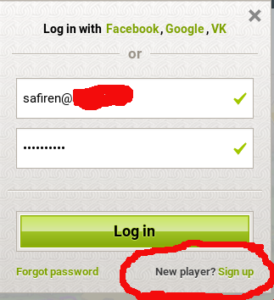 Your dual also have to register before you can add him/her. You need the email your dual has used.